Today: A dinner that even Katy Perry would enjoy. Remember when it was 2009 and everyone was singing that Katy Perry song? "'Cause you're hot then you're cold, you're yes then you're no, you're in then you're out, you're up then you're down, you're wrong when it's right, it's black and it's white." We hear you, Katie -- it is frustrating when the food we would expect to be hot is disturbingly cold. But what about when warming comfort food is paired with cool, refreshing vegetables? Here's a dinner that's not hot then cold -- instead, it's hot and it's cold. 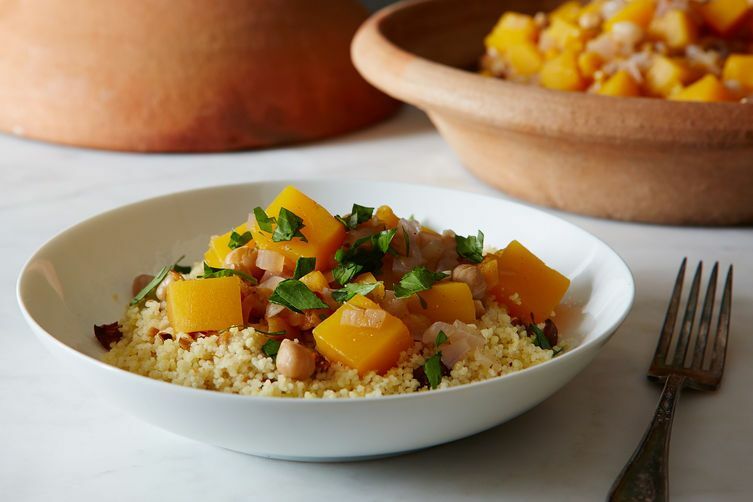 Enjoy a soul-satisfying tagine -- soft vegetables on fluffy couscous -- then cool down with a fresh, crunchy salad for a meal that's the best of both worlds. You probably have olive oil, garlic, ground cumin, ground ginger, cinnamon, crushed red pepper, dried thyme, salt, peppercorns, vinegar, and mustard. If not, add those to the list, too. 1. Heat 3 tablespoons of olive oil in a large pan with a well-fitted lid (or a tagine, if you have one). Add the red onion, diced, and 4 cloves of minced garlic and sauté until soft, about 5 minutes. Add spices -- 1 teaspoon ground cumin and 1/2 teaspoon each of ground ginger, cinnamon, crushed red pepper, and dried thyme -- and stir until fragrant. 2. Add the winter squash, chopped into 1-inch pieces, to the pan along with the chickpeas, apricots, and enough water to almost cover the squash. Bring to a boil and simmer for about 20 to 30 minutes, as long as it takes for the squash to be soft but intact. 3. Meanwhile, prepare the salad. Core the fennel bulb, trim the celery, then cut the fennel, celery, and radishes as thinly as you have patience for. Tear the lettuce into bite-sized pieces and add it to a shallow bowl with the other vegetables. 4. Preheat the oven to 400° F. Then, spread the couscous in a shallow baking dish, cover with boiling water, and let sit for 5 minutes, until it has soaked up all of the liquid. Fluff it with a fork, then season with salt, chopped, roasted almonds, and 1 tablespoon of olive oil. Put the baking dish in the oven until it is warm with a crunchy top coat. 5. Toast the celery seed and peppercorns in a hot skillet. Using a mortar and pestle (or a plastic bag and a rolling pin), crush the celery seeds and peppercorns with 1 teaspoon of salt until well combined. Add the hazelnuts and crush lightly. 6. Chop your shallot, then whisk it with 2 tablespoons of vinegar, 1/4 cup of olive oil, and 1 teaspoon of mustard. Season with salt. Set aside. 7. When the tagine is almost finished, toss the salt with the dressing and sprinkle the nut and spice mixture over top. Serve the tagine on the bed of couscous and sprinkle with the chopped parsley. 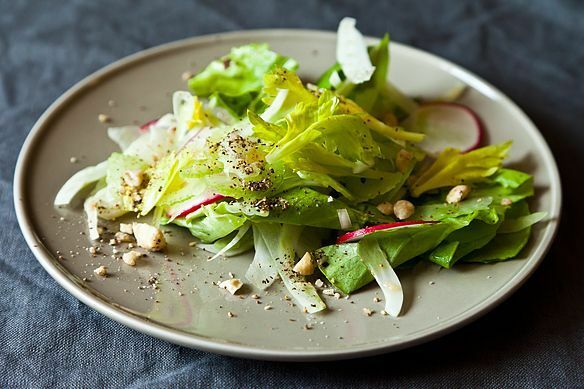 Both these dishes are right up my alley, but the salad is something I'd really like to try. Have never used fresh fennel, but it's about time I did.